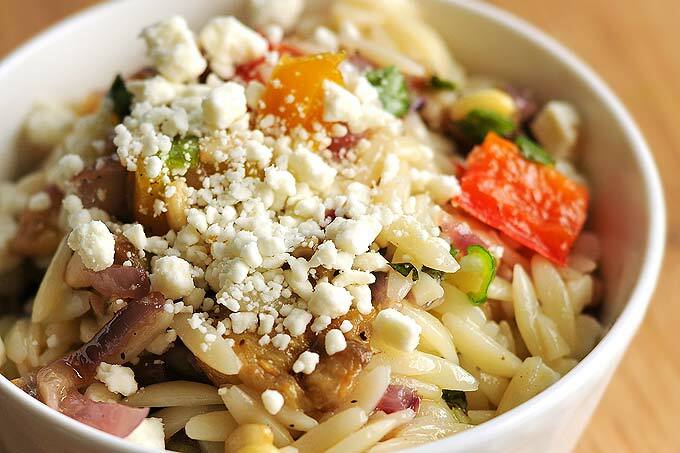 This Roasted Vegetable Orzo Salad Recipe will soon become a favorite. This dish is packed with so much flavor and satisfying as a main dish or side salad. And it’s perfect choice for a Meatless Monday or to pack along for lunch any day of the week. Confession time. I have a tendency to be a pasta-holic. If I’m honest, I would have no qualms with eating pasta for each and every meal. Of course, I don’t do that. Of course not. That would just be crazy, wouldn’t it? It doesn’t help at all that pasta is so easy to make. The ease and versatility of pasta makes it a regular go-to for when rushed for a last minute meal or as a dependable dish to prepare ahead for any kind of entertaining. For me it’s the perfect comfort food. Comforting when I’m rushed and hungry and comforting when I need to prepare food ahead of time. When my friend, Denise, first shared this Roasted Vegetable Orzo Pasta with me, I was surprised with how much flavor was packed in such a simple dish. So a couple of weeks back when she said she was making a batch, I jumped at the chance to invite myself to assist so I could learn a new recipe. This recipe is so easy. All that is needed is some simple chopping, tossing, and roasting, then some more tossing, and you’re done. That’s it. Except for the eating part. While this Roasted Vegetable Orzo Salad can be served as a side dish, it really can stand alone as a main course too, especially for a Meatless Monday. The meat won’t be missed at all. Also, this salad is just as delicious served cold. It only gets better after it is allowed to mingle together in the fridge for a while. Make a big batch Sunday night and enjoy it throughout the week! I’ve already done that a couple of times since discovering this super tasty orzo salad. I think you’ll find this orzo salad perfect for a picnic, cookout, dinner party or an easy packable lunch. It’s easy to prepare ahead of time, a great compliment to so many entrees, like Coconut Milk Baked Chicken. What’s not to love? Enjoy! An easy and tasty Roasted Vegetable Orzo Salad recipe that is great as a side or main dish, and perfect for a meatless option. Toss onion, peppers, eggplant and garlic with olive oil, salt and pepper, and roast on large baking sheet for about 30-45 minutes until browned. Turn once or twice during roasting. While vegetables are roasting combine dressing ingredients until smooth. In a large bowl, add roasted vegetables, and dressing to drained orzo; toss until combined well. Let cool slightly. Add green onions, pine nuts, basil and feta (optional) and lightly toss. Add additional salt and pepper to taste. Serve right away at room temperature, or cover, refrigerate and serve cold. Originally published July 28, 2011. YEP. Speaks my to my soul innards. IN. LOVE. Orzo is seriously underused! It’s one of my favorites. Plus, adding roasted veggies, pine nuts, and feta to anything, automatically take things to a whole new level of favorite on my food scale! This looks amazing!! This has ingredients I LOVE! I def need to make this. Love every single thing about this recipe! Just wonderful. THAT has my name all over it! Wenderly…Wenderly…Wenderly… (see?) I want some. Amy! I love everything about this salad…. *except* for the fact that it’s not sitting right here in front of my for lunch. Confession…I have eaten this for three meals in one day….and it was REALLY good all three times! I hardly ever cook with Orzo and I don’t know why because I love it! This looks fantastic. I’m a big fan of pasta too. Oh my goodness….yum! This has all of my favorites in it and it’s perfect for summer. Flagging to my recipe list! As an amazing cook, what do you think of my bacon-blue cheese sliders!?! I adore pasta but ha never tried orzo til recently…it’s an addiction now! This is my kind of pasta. I’m with you, I can eat pasta in any shape or form at pretty much any meal. Looks delicious Amy! 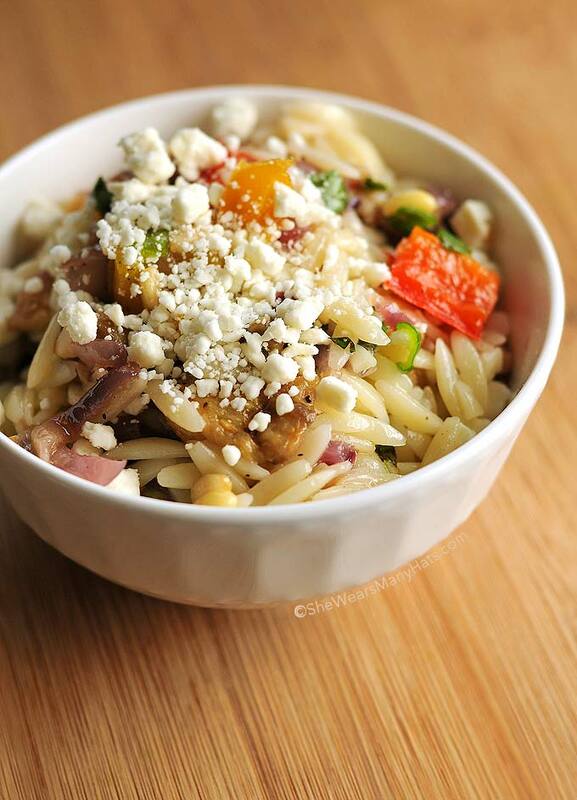 I love roasted vegetables with pasta and orzo happens to be one of my favorites. 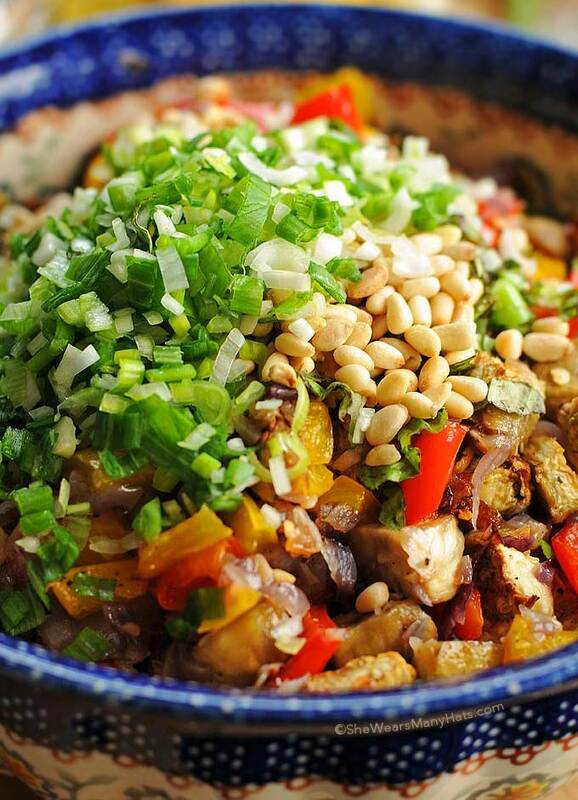 I also love to see the green onions sprinkled in here – love the flavor of them! Oh how do I love orzo! And like you I could probably eat pasta everyday at every meal. lol. Must try this salad! 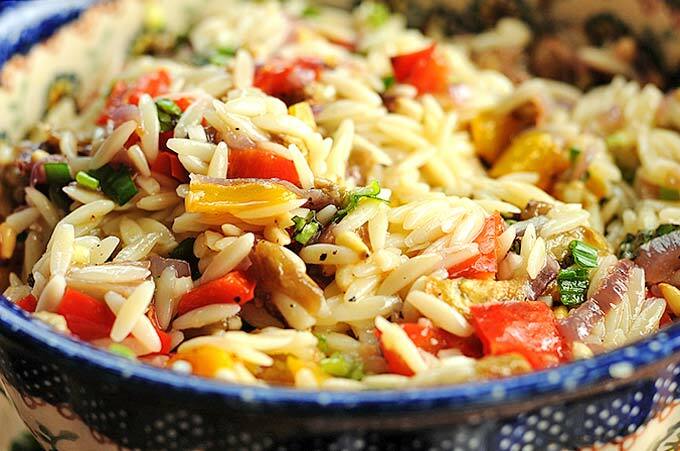 I love roasted vegetables and in this orzo salad, just beautiful. Reminds me of a similar orzo salad my friend made at a recent BBQ. Love orzi with sauteed mushrooms and onions. simply salted and balck peppered. Amzinf even cold. This dish looks so good! I have been craving orzo and had some for lunch today but now I see this. It looks soooo good. Will make it this way next time! yep . . . this one’s a keeper! So glad to know that there is not just me who is a pasta holic! I made orzo the other day and was planning to post but was hungry to wait. This looks so colorful and delicious. Now I know why I love you so much – cuz I’m a pasta-holic too. So this salad looks perfect to me Amy. What a great looking dish! Makes me want to go out and buy some Orzo right now! Oh my goodness, I wanted to grab that bowl of orzo right through computer! Am definitely making this recipes! Thank you! Beautiful pictures. My mouth is watering! Orzo is one of my favorite pastas, and it’s a big treat when I make it, as I don’t serve pasta very much. I have a couple summer orzo salads I like to make, but this one looks especially yummy with all those roasted veggies. I am going to try this – thanks! I adore orzo pasta salads, and I am salivating at the thought of adding roasted vegetables to the mix. 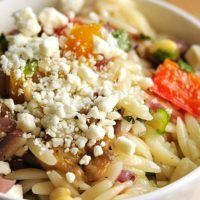 Gorgeous recipe..
Love orzo; it’s been a favorite since a local pasta shop starting selling it at a Saturday farmer’s market. So many great flavor varieties; all would be great with the flavors you’ve used here. I’ve always been a huge fan of orzo and yet i so rarely use it. This salad is right up my alley! I made this tonight, and it was really good! I will skip the eggplant next time…it just shrivled up during roasting and all was left was the purple shell that got really hard. I’m also going to cut back on the oil, that’s quite a bit! 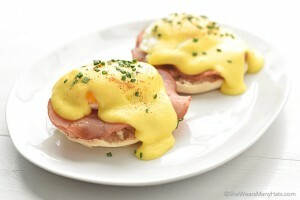 Thanks for the recipe that can easily be adapted to ones likes!! This sounds delish! Can’t wait to head out to the farmer’s market for veggies! Made this last night, very easy, and indeed tastes even better cold the next day! Can’t mess this recipe up. Definitely include the feta. Basil leaves start off as an intense flavor initially, but get toned down the longer it sits. It sounds like you enjoy it as much as I do. It’s one of my favorites any time of the year. I think couscous or brown rice would be a nice substitute, Allison.